Home / Academic Calendar / Traveling for Fall Break 2018? 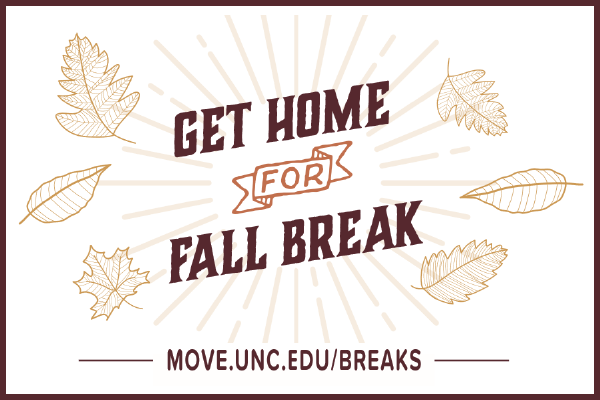 Ride BreakShuttle from UNC Oct. 17, return Oct. 21. $29 ticket special until Oct. 9. Connect to Amtrak, Greyhound, or Megabus! From UNC, take GoTriangle bus 400 for $2.25 each way. Ride PART Route 4 for $1.25 with your student ID. Stops include Mebane, Graham, and Burlington. Free P2P airport shuttle from UNC – reserve a seat or take GoTriangle buses for $2.25.